Selected Works of Kirsten R. Brown, Ph.D.
More than 50% of all college students with a disability enroll in public 2-year institutions. Autism Spectrum Disorder (ASD) is a type of disability that affects a growing number of students in postsecondary education. Currently, over 70% of 2-year public institutions enroll students with ASD. In spite of increased awareness, the vast majority of existing ASD research focused on primary and secondary education. Research on practices that support students with disabilities in the community college environment is imperative for promoting student success. The purpose of this mixed-methods study was to explore current and best practices that support students with ASD at 2-year public, postsecondary institutions. A web-based tool was used to survey a nationally representative sample of disability service professionals from 367 2-year, public institutions (35.4% response rate). Our results show reasonable accommodations with an academic focus (e.g., extended exam time) were provided more frequently than sensory accommodations. 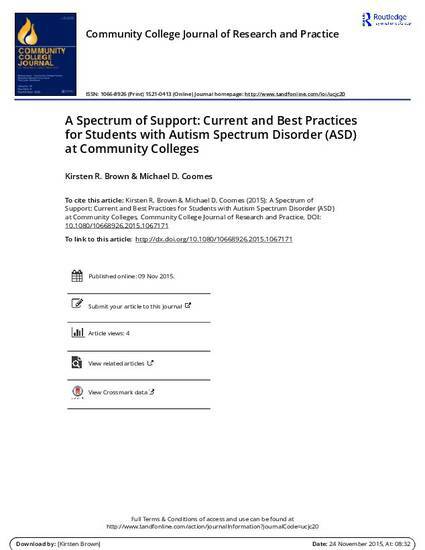 General support services that focused on the transition to college were offered by 42% of the institutions surveyed, and 26% of institutions supplied ASD-specific services. These results indicated that many institutions provide students with a baseline level of academic accommodations; however, accommodations and support services that specifically target the functional limitations of ASD are offered less frequently. Best practices for supporting students with ASD were synthesized and implications for practice were discussed. Contact Kirsten R. Brown, Ph.D.